Now there has been this thing on social media that’s been trending called #TheDress. Now I’m a fashionista so naturally I was pretty curious about what it was. I had people all over my twitter posting about this dress. 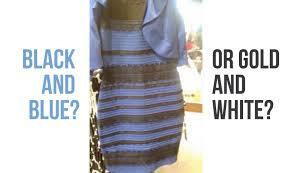 Now I just saw a black and blue dress so I didn’t see what the big deal was. Then I started reading the comments and found out that some people saw the dress color to be white and gold. I thought this was insane because all over social media people were fighting back and forth about what color the dumb dress was. Further curious, I walked over to my parents that night and asked them what color they saw. Apparently I’m the only one in my house who saw the dress as black and blue. We had a miniature family war over what color we saw. I did some reading into how it was possible for certain people to see one color and other people see another color. I read things from someone’s mood affecting what color you see to people claiming that it has to do with being some sort of color blind. I mean this lasted about a week guys! It was crazy how much attention this silly dress got and how much conflict it caused. There were even celebrities such as Taylor Swift joining the trend posting what colors they saw. I also own this game called Crossy Road on my phone. I really love the app and find it quite fun, especially when i’m bored. The objective of the game is to try and cross as many roads as a character without dying. One is able to unlock different characters. I had almost all the characters and then I found out there was this update that would open up more characters so I got the update to challenge myself some more. I started looking through the different characters and what do I see? One of the characters I saw…. was #TheDress! I kid you not! 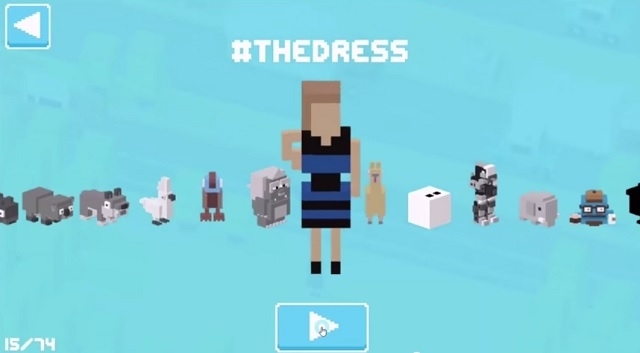 This crazy dress got so much attention that it even get’s it’s own character on a popular game! When you play as this character the dress changes from black and blue to white and gold each time you play it! It’s absurdly cool! Now you may be thinking I created this outfit using #TheDress as inspiration but I assure you that is not the case. I created the outfit and then after taking a good look at it I made a little joke inside my head. I told myself “is the dress white and gold…or do some people see black and blue?” Yes I know it’s a silly joke but I thought it would make for quite the interesting post, especially for those who have no idea what it is. To be completely honest the first thing I thought about when I saw the completed outfit was how it looked like something one of the Kardashians would wear because they seem to wear a lot of white. I mean I don’t blame them, the color looks good on them. Now I do want to point out that this outfit ended up being a bit more than fifty dollars but how could I not post it? I thought it was too good of an outfit to waste. Now usually I would try and avoid crop tops as much as possible because I was very self conscious about exposing too much skin or if that would look trashy. I have recently discovered that crop tops are not a bad thing as long as you know how to dress it right and make it look more stylish and classy without the intention being to expose a lot of skin. I have found that high waisted bottoms look better with crop tops. That’s why I included a high waisted skirt with the crop top. Yes you may expose a little bit of skin but it doesn’t look trashy, it’s still pulled off as classy. The heels are lace and expose almost a brownish goldish tone which is where I combined the earrings to match. What I love about this all white outfit is that you can put pretty much any jewelry and it will still match. You can use vibrant colors to make the outfit fun or use subtle colors to keep it more elegant. Look at the picture of the dress and leave a comment telling me what colors you see. I would love to see how many people see one color over the other.